Happy Birthday Paul Fleishman, (Bull Run, Joyful Noise: Poems for Two Voices, Seedfolks). It’s the birthdate of the Wild West outlaw Jesse James (1847-1882). On the Road by Jack Kerouac was published on this day in 1957. The first ever Labor Day parade is held in New York City, 1882. Read Parade by Donald Crews. National Waffle Week kicks off today. Read Everything On a Waffle by Polly Horvath. Although some schools began in August, this week many children are headed back to school and some are headed there for the first time. Starting kindergarten is a topic so well covered by children’s books that I sometimes mistakenly think no one can come up with an original approach. But then creative people always find new ways to look at old ideas. 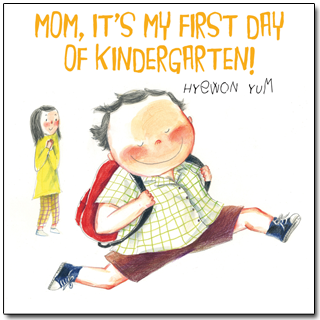 I was delighted to read Hyewon Yum’s Mom, It’s My First Day of Kindergarten! 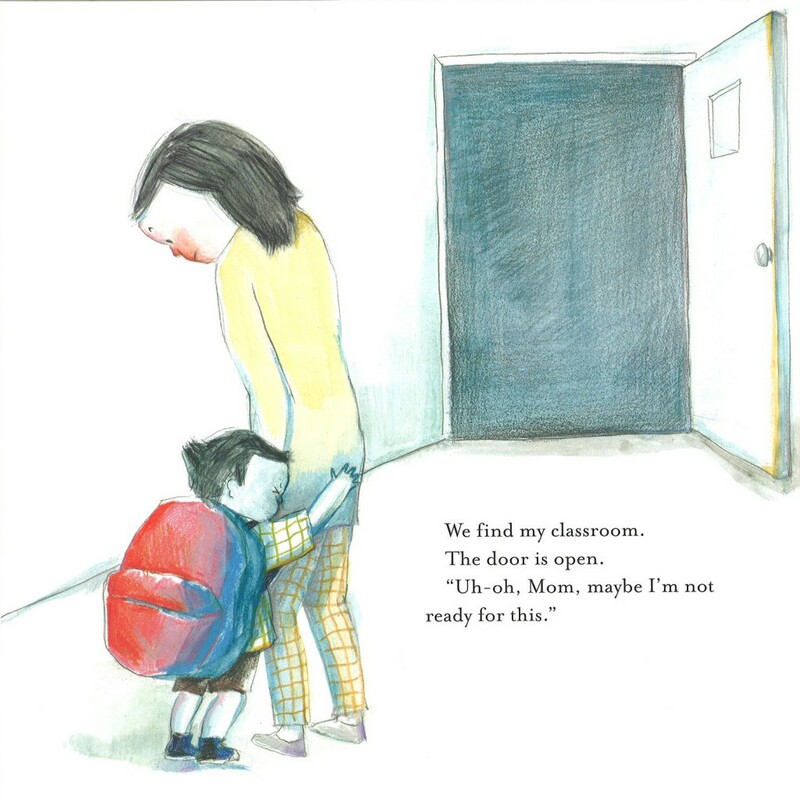 In a book that is clearly based on her own experience, Hyewon Yum presents the arrival of a new school year from her own unique perspective. The cover sets up the dynamic of the book. A confident, ebullient youngster, holding backpack straps, leaps across the book, ready for his first day of kindergarten. An anxious mother trembles in the corner. And so their story continues, “Mom, wake up! It’s my first day of kindergarten!” our protagonist exclaims. He looms large; she looks diminutive. She worries about supplies, big kids, being late. He dances and prances and can’t wait to get to kindergarten—because he is already five! But as they actually reach the door of class, our confident hero balks. Maybe he isn’t ready at all. As the roles reverse, his mother reassures him that all will be well in kindergarten. And just as the boy thought it would be, kindergarten is awesome; the day goes by in a flash. Both mother and son seem happy and content now—until he mentions taking the bus to school tomorrow. Mom, It’s My First Day of Kindergarten! reminds all of us that the beginning of school is a family affair. So often the fears we think to be our children’s are ones we place on them from our own experience. The book refreshingly shows an optimistic young protagonist who can’t wait to see what life—or in this case, kindergarten—can bring. Yum’s watercolors work to delineate character and to keep readers turning the pages to see what will happen to the bouncing boy. This wonderful combination of realism, child psychology, and a universal situation holds up to many readings. And not only will it reassure children headed to school this week, it may make a lot of moms and dads feel much better as well. Originally posted September 5, 2012. Updated for . Instructional materials from TeachingBooks.net for Mom, It’s My First Day of Kindergarten! Must check this out. I love the blackness inside that open door–a great artistic decision. Thanks for letting us know about it. Anita’s line: “So often the fears we think to be our children’s are ones we place on them from our own experience.” took me back in time to a place where I unwittingly did this to my daughter concerning early-days school. When you come from a past of harm, you become a twenty-foot giant of a warrior for your own child. Unfortunately, this can lead to even more trouble for the child, than is mentioned here. It took a long time, and some anxious unlearning for me to get that into balance. Can’t wait to read this jewel! I’ll have to check out this one! My preschoolers came today for the first day, and the day went well: only a few tears and those were all mom tears! Leda, Gordon, and Kelly: Thanks for the comments. Hope you enjoy this gem.